The Hebron land where Karen Wrentzel was shot and killed in 2017 is now posted, and no access is allowed without written permission. 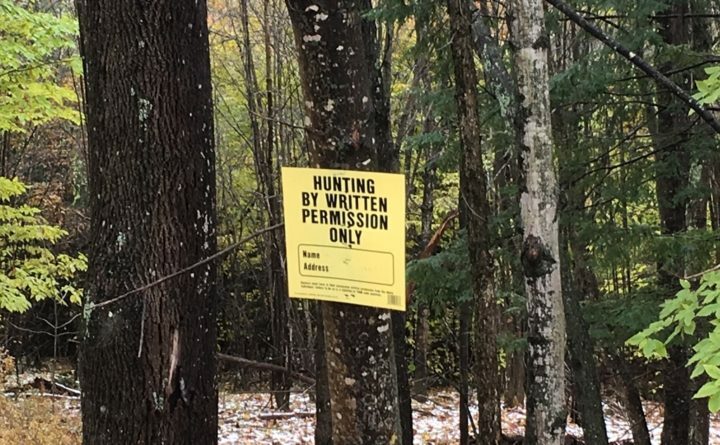 Newcomers to Maine are often surprised to learn that, according to state law, hunters and many other recreationists have an implied right to access most of the state’s land, so long as that land hasn’t been posted with “No trespassing” or “Access by permission only” signs. According to the Maine Department of Inland Fisheries and Wildlife website, “signs must indicate that access for a particular activity is prohibited without permission of the landowner or landowner’s agent, or that access for a particular activity is prohibited.” Signs or purple paint stripes must mark the property each 100 feet and should be placed at all locations where people would access the property on foot or from a public road. But that’s not good enough for many. Bruce Tibbetts is a hunter. He’s also a member of the family of Karen Wrentzel, the Hebron woman who was shot and killed by a hunter while working on her own land in 2017. Wrentzel’s land wasn’t posted at the time, but it is now. And Tibbetts has a problem with the default position of the Maine law, which gives the hunter — or trespasser, in the eyes of some — the right to access another person’s land as long as it hasn’t been marked. Tibbetts said he considers it his responsibility to ask for permission before hunting on someone else’s property. Tibbetts was pretty convincing. But when I stopped to think about what a complete switch in state law would mean, I realized that it would have some pretty serious effects. I’m among those who’d never think of stopping off on a well-traveled town road and hiking into private property in order to find a deer or a turkey unless I’d previously been granted permission. But up in the big woods of Maine, where large landowners have a well-established open-access policy, I act differently. Up there, I feel free to drive woods roads looking for moose or birds, and staging hunts there without seeking permission in advance. Would a change in the law affect those lands as well as parcels in more populated areas? Mention the possibility of changing that law and requiring that folks have permission to access the land of others and you’ll hear it from sportsmen and women who have grown up with the Maine status quo. In fact, that’s what I’m counting on. What do you think about Maine’s law regarding the posting of land, or the implied open access policy on land that isn’t posted? Others find it amazing that Maine law places the burden of denying access on the landowner, rather than switching that responsibility to those who would have to ask for permission to recreate on land they don’t own. And I’d love to hear from that constituency as well. So tell me: What do you think of the current law? Is it time for a change? Or is this one of the uniquely Maine customs that deserves to be preserved? You can share your thoughts at the email address below. I’ll compile some of your responses in a future story or column.